This was the reason I wanted to visit Uganda. I wanted to go mountain gorilla tracking. And today was the day we would go! We got up very early since Kabale isn't that close to where we the gorillas are. The roads are very curvy, dark and misty as you leave Kabale and climb to the Bwindi National Forest. There are a number of locations in Bwindi to track gorillas and you have to purchase Permits. Then they tell you where to go. Permits are expensive (around $500 per person) and you need to get them at least 6 months ahead of time or they might be gone. We got sent to the Rhija gate which was a fairly new tracking location at the time. Habib dropped us off and special Gorilla tracking guides with guns took us into the jungle. It was STEEP, TANGLED and HUMID! My ankles keep twisting and getting caught in the vines. But we did manage to see them! We saw two silverbacks, a few females, two young males and a baby. Once you see them the clock starts ticking and you are only able to stay with them for 1 hr. Since gorillas and humans have 97% identical genetic code it would be easy to pass on diseases and with only 800 mountain gorillas left in the world, we dont want to do that now do we? 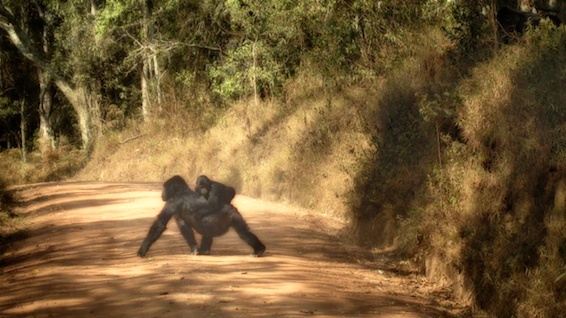 The gorillas were constantly on the move so it was tough to keep up with them, especially through the jungle. But we got some clear views of them as they passed right across the road we drove in on. In fact had we just stopped a 1/4 of a mile before the entrance we could have seen them for free!!! !